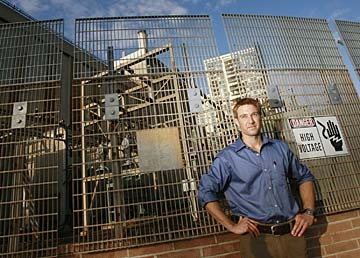 Sierra Club of Hawaii Director Jeff Mikulina has adopted a solutions-oriented approach in lobbying legislators or recruiting new partners in his battles against fossil-fuel addiction, environmental degradation and the loss of biodiversity. Jeff Mikulina's bad dream begins benignly. Schoolchildren rush into a McDonald's restaurant and gather at the counter like yapping puppies. They all order Happy Meals, then wait exuberantly for their McNuggets, fries and drink. But with the meal comes a promotional treat: a tiny plastic replica of a GMC Hummer. Inertiative: n., "all the great ideas in this town that never seem to get going -- e.g., curbside recycling." Slacktivist: n., "the new generation of 'activists' who can't find it in themselves to really fight for something like it matters (see inertiative)." Faces bright with excitement, the kids roll their new toys across the table, perhaps anticipating a day when they will own and drive a 4-ton SUV that gets six miles to the gallon as it tears over off-road terrain. McDonald's USA placed Hummer toys (and Polly Pockets for girls) in Happy Meals and Mighty Kids Meals last August, declaring in a news release, "Always ready for adventure, Hummer's iconic vehicle design sparks the imagination of children nationwide." As a student of motivational psychology, Mikulina holds grudging admiration for the McDonald's-Hummer drive, aimed at future generations of consumers. But as one of Hawaii's top environmentalists, he would hope to see more responsible sparks ignited in the imaginations of U.S. youth. "It's tough because there are so many strong influences out there," says Mikulina, director of the Hawaii chapter of the Sierra Club since 1998. "I mention Hummers because they are the most egregious vehicle out there, but they are very effective at guerrilla marketing and getting to the keiki. ... But there are examples everywhere. What is normal and what is acceptable is really out of sync with our longevity on the planet." In his eight years here, Mikulina has carved out a reputation as a reasonable and engaging champion of conservation and sustainable consumerism. He has carried that reality-based idealism to the Honolulu Planning Commission, weighing in on matters relating to land use and development. The commission recently passed one of the first "downzonings" of land on Oahu, reclassifying a Pupukea parcel from "country," which allows development, to "agriculture," which doesn't. The commission also recently approved changes to increase scrutiny of vacation cabins. 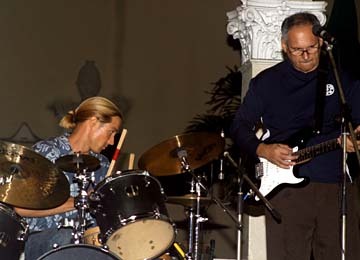 Jeff Mikulina plays drums for a funk band, Soul Treatment, with Office of Hawaiian Affairs Economic Development Director Mark Glick, right, on guitar, and, not shown, Earthjustice attorney Isaac Moriwake on bass and Simone Cole on vocals. The band, which jams in the Earthjustice law library, has played at the Hard Rock Cafe and UH law school graduation and has a couple of wedding gigs lined up. Their musical fare includes some Steely Dan, Alicia Keys, Sade and Jamiroquai. "Nothing serious," says Mikulina. "This is just stress relief." "We're seeing a different kind of land development than we were seeing in the past half century," says Mikulina. "And this is mostly second and third homes and transit vacation type of rentals, which are changing the fabric of the islands, particularly on the neighbor islands. It's crept up on us, but now is really affecting land prices and housing prices and has helped create this affordable housing crunch and has put new pressures on agricultural lands." An engineer by education, Mikulina adopts a solutions-oriented approach when he lobbies legislators or tries to enlist new allies in his fight against fossil-fuel addiction, environmental degradation and the loss of biodiversity. He's been on the front lines of recycling, pedestrian- and bike-friendly initiatives. At the Capitol, he has been busy trying to push through bills to identify, regulate and reduce greenhouse gas emissions in Hawaii. As a prop, he hauls around a plastic bag holding nearly two pounds of crushed charcoal, representing an hour's worth of atmospheric carbon generated by the average Hawaii resident. He recently gave his first presentation on global warming based on his training in Nashville, Tenn., Jan. 8-11 with former Vice President Al Gore. Building on material Gore used in his documentary, "An Inconvenient Truth," Mikulina outlined the dangers of climate change at the Malama Maui festival at Maui Community College. Mikulina believes he is the seventh or eighth Hawaii resident trained by Gore to spread the word on the atmospheric effects of burning fossil fuels like coal, oil and gasoline. "He stayed with us for two days," Mikulina says of the 2000 presidential contender. "He went slide by slide through the whole thing. He's so passionate about it, and he's genuine. I don't think he's going to run in '08. I think he's found his thing." A native of La Crosse, Wis., and the son of an engineer, Mikulina admits it took him years to find his own "thing" despite the idyllic natural setting of his youth. "La Crosse is really unique in that the Mississippi River goes through it and it carved out these bluffs on both the Minnesota side and the Wisconsin side," he recalls. "Going back now, I (realize) how gorgeous the setting was with all these valleys -- coulees, we called them, and forested areas." Mikulina grew to love hiking and biking, and won a berth on the downhill ski team in high school. An early desire to become an astronaut gave way to more earthly pursuits as an engineering major at the University of Illinois at Urbana-Champaign. By sophomore year he had doubts about that direction. He met with a faculty mentor, who took out a sketch pad and quickly drew the twin towers of the World Trade Center, then still a proud landmark. "He said, 'Imagine there is a beam going across those two buildings and you are on the roof of one. What would make you walk across the beam to the other building? Whatever that is, that is what you have to do with your life.' And so that was kind of the moment that awoke a lot of things in me." Mikulina decided saving the planet would be worth traversing a long plank 1,360 feet up. "I would relive that over and over at different stages of my life," he recalls. "And on Sept. 11, besides the real visceral punch of those buildings coming down and the loss of life, it was also sort of, wow, what my adviser didn't say was, you'd better cross the beam sooner rather than later because it might not always be there." His first paid work for the Hawaii environment was on a 1995 summer internship with Unitek, inspecting and cleaning up old canefields. He earned his engineering degree -- but with a specialty in environmental quality -- at Urbana in 1997 and was part way through a master's program when he heard about the opening at the Sierra Club. John Harrison, recently retired director of the University of Hawaii Environmental Center, recommended Mikulina. "He had tough shoes to fill because prior to his taking over, the person in charge of the Sierra Club was David Kimo Frankel," recalls Harrison. "And Dave was an attorney and very articulate and very active and very effective and had been instrumental in elevating the profile of the Sierra Club from kind of a more tree-hugger, grassroots organization to an effective lobbying and lawmaking advisory group, all the while preserving the kind of participatory activism the Sierra Club is known for. Jeff came in and was a really quick study. Even though he is not an attorney, he worked really hard and established himself as a straight-talking advocate of conservation and environmental management." Peter Young, who as director of the Department of Land and Natural Resources has found himself at odds with the Sierra Club on some issues, remarks: "When anyone communicates with Jeff, you know where he stands on an issue. ... He's absolutely passionate about making sure this place is better for the future." Mikulina's next allies in that quest, he hopes, will be faith-based organizations as part of a trend toward the "greening" of religion. "A large part of this community goes to church or synagogue once a week and they listen and alter their life in some way," he says. "How come we haven't been able to capture that same sort of life-changing, behavior-changing aspects?" Mikulina gains particular encouragement from the work of Interfaith Power & Light, a coalition of church groups focused on climate change. It is established in other states but just beginning in Hawaii. "With global warming, the writing is one the wall," says Mikulina. "No other state has what we have here with the mix of resources, from sun to wind to wave, and yet we keep on using more and more fossil fuels. The irony of it is, we're going to be whacked the hardest of any state with climate change."